Instead of resources or land, "capital" today means human capital. It doesn't take a shoe factory to go into the shoe business these days. Nor do you need raw materials or fleets of trucks. Nike became a shoe industry leader by concentrating on the value-producing capacity of it's employees, for design, marketing and distribution know-how. The real capital is intangible: the person's knowledge level, combined with an aptitude for application. The current “jobless” recovery is a result of our economy evolving from a resources and manufacturing based economy, to a knowledge based one. North America have reappeared in India, China and Mexico. We are now witnessing the first recovery in what has become a full information economy. Investment in new capital equipment is no longer a pendulum swinging form recession to recovery and back again firm - the result of inventory that needed to be sold off. Because job growth now depends on the creation of net new positions in different firms and industries, you can expect a long lag before employment rebounds. Employers incur risks in creating new jobs, and require additional time to establish and fill positions. America's challenge is to leverage its % of the global population into a much larger percentage of intellectual capital competitiveness. Knowledge Workers are the backbone in all sectors of the economy: most obviously in the Information and Communications Technology (ICT) sectors but they also embrace the other industrial sectors including healthcare, manufacturing, transportation, and the Public Service. Labour Market Studies indicate that there is already a looming Knowledge Worker skills shortage – a shortage that impacts competitiveness and economic and social development. These shortages will not diminish soon because skilled “Baby Boomers” are retiring in unprecedented numbers while the newly created knowledge economy jobs require more education and higher skill levels. ‘The War for Talent’ today is a qualitative conflict that is best characterized as the ‘War for the Best Talent’ - a global conflict being fought amongst the G7 countries with the winner taking all. Knowledge economy jobs are borderless - a vacancy in San Francisco may be filled by someone in China, India or elsewhere. As a job-hunter, you need to comprehend that the production of value is the most important criterion for an employer when hiring. Articulating your value is your key to successful job-hunting; it sepa­rates you from all the other job-hunters. Understand, value is not salary; worth does not flow from a job title. Knowing what's impor­tant to a company means looking beyond job descriptions and compensation tables, especially today when sudden changes and uncertainty are the norm. The New Value Table in Guerrilla Marketing for Job Hunters is the ideal jump-off point for articulating yours. Meet Mike from Bridgeville, Delaware. A devoted husband, father, has a mortgage, and unemployed. Although I would venture to guess that you’ve likely never met him, I’m reasonably sure that as a follower of this group you can identify with him. Mike was laid off last February. Like millions of other job seekers he had over 20 years experience and is over 40 years old. He's also in a profession where employers prefer them to be "young." IOW, not Mike's age. Does any part of this scenario sound familiar to you ? During this time, Mike did what almost everyone else does when it came to finding a new job. You may recognize this fandango; spending endless hours trying to “perfect” his resume and cover letter, scanning the job boards for potential opportunities, applying for positions, never hearing back about the status of his resume etc., etc. Time was quickly passing and his resources dwindling. One day (about) 2 months ago, Mike by his own admission was at his wits end and came to the conclusion that if he were going to achieve his goal of landing a good job before the end of 2009, he was going to need a lot of extra horsepower. Mike then found the courage to bite the bullet and contact us at the Guerrilla Job Search Boot Camp to ask what we could do for him. Mike signed-on for the one-on-one 10 week Guerrilla Job Search consulting. Fast Forward (to Monday) November 30, 2009. Mike started his new six figure position with a well known Fortune 500 financial organization ! • By Mike’s own estimation he lost $ 180,700 or more in salary and benefits (value) since last February. • Mike is now working in his dream job and in a telecommute position ! • Mike had already read Guerrilla Job Hunting 2.0 and said he loved it but felt he needed personal Guerrilla consulting to push his job search over the edge. • Within (about) 5 weeks of working with us, Mike received one verbal offer that ultimately ended up being put on hold. Prior to this, he had none. • By week 7 or so, Mike had 2 more firm offers in hand “in addition” to the offer he ultimately accepted for a total of 3 offers that were firm. • By Mikes own estimation, he met only 50% of the actual job requirements for the position he now occupies ! • Mike was invited to more interviews working with us for just 2 months than he did the previous 7 months. • Using Guerrilla consulting tactics, this position was created for Mike as it was never advertised. If you are intrigued by the success of Guerrilla Job Seeker consulting, simply email me and I will provide Mike’s number and you can ask him in the evening hours. 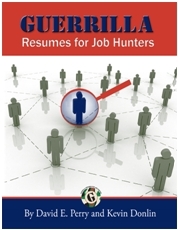 If you would prefer, my friend and colleague and fellow Guerrilla ---Kevin Donlin also interviewed Mike last week regarding his Guerrilla success as a job seeker. I will gladly email you a recording of that short discussion so you can hear it for yourself. Don’t procrastinate, call us to get a job faster.....and have a Great Guerrilla Day ! The most recent hire was hired because she sent me a beautifully hand designed booklet which contained the best samples of her design work. She didn’t just email me a link, or send a resume. The fact that she went over the top to design a hand made booklet was impressive. In fact, her experience on its own wouldn’t have gotten her the interview, much less the job. But the book did it! I worked with one client who specialized in retail merchandizing (POP, planagrams, etc). After developing her resume, we discussed putting together a targeted job search campaign to go after some of the bigger players in retail. While working out her “unique selling proposition” she made the claim that she could walk into any retail environment and recommend how they could make more money through better merchandising. I asked, “Can you really back that up?” and suddenly her plan was born. “Please hand this to him at the end of his meeting. It’s very important” and she walked out. Shortly after 11:00, the VP of Marketing came downstairs, met her in the coffee shop, and spent the next hour walking through every corner of the store discussing her findings. Although no such position existed, the VP hired her as their new Director of Merchandising. After being laid off, George Brown knew exactly which company he wanted to work for next, but every time he called, Human Resources told him the company wasn’t hiring. So George sprang into action, and another guerrilla job-hunter was born. George printed business cards that were round, slightly larger than normal, and very colorful. On the front was a picture of a pizza with a circle-shaped message: “Win a Free Pizza.” The flip side of the card gave his name, e-mail address, and telephone number along with the promise of a pizza for the first person to get him an interview with a manager in the company. Dressed for an interview, George stationed himself at the entrance of the company and handed out cards to everybody who would take one. He kept this up for a couple of days and became a topic of conversation at the company. One manager figured that anyone who would go to so much effort deserved an interview. One extra-large pizza later, George guerrilla-marketed his way to the job of his dreams at very little expense, and the company is more profitable because of it. Compliments of Shari Miller, Principle of The Elmhurst Group, www.elmhurstgroup.com.